Experience the charms of Provence and the warmth of its people from your own home base. Our secluded, gated property — Le Mas du Real Laugier — provides a serene retreat in the medieval village of Lorgues. This exceedingly private country house and its lush, old-growth gardens set the stage for a tranquil and memorable holiday, and will easily accommodate 8 people, 10 if need be. Our rates are all-inclusive: personal welcome at your arrival, Carré Blanc bed linens, bath and pool towels, cleaning service before and after your stay and on-call local home management. Le Mas du Real Laugier rests on a small promontory — an easy 1.2 km walk (0.75 miles) to the village center. During the 19th Century, our home was part of the “Train des Pignes” railway system. The street address is still the “Chemin du Train des Pignes Ouest,” indicating these fascinating origins. ”Mas” means Provençal farmhouse or country house, and that suits this gracious and generous 2,400-sq. ft. stone house on three levels. The rez-de-jardin (garden floor) features a bedroom with double bed, bath with walk-in shower and separate toilet, along with the laundry room and a wine cave. The rez-de-chaussée (ground floor) includes the kitchen, living area, fireplace and a dining area. Also on this floor is the spacious, high-ceilinged master bedroom with king bed, traditional stone walls and en-suite bathroom with walk-in shower and separate toilet. French doors open to the front garden from the bedroom and the dining area. The premier étage (2nd floor) offers two bedrooms and a roomy landing, which holds a small office and an antique iron daybed — ideal sleeping for one. The first bright-and-airy bedroom has two twin beds and a view of the gardens and pool area below. In the second bedroom, a sleeper sofa unfolds into a cozy double bed. The large full bath, with toilet, tub and shower wand, features hand-made ceramic tile from the village of Salaries. Two large outdoor tables each seat 8-10. There's a BBQ, plus outdoor buffet. A short stone walkway leads to the glorious heated pool and pool house. By car, we are about an hour from St. Tropez, an hour and 15 minutes from Nice and 90 minutes from Marseilles. It is only a 20-minute drive from Lorgues to the Gare Les Arcs-Draguignan, where you can catch the TGV express train to Paris. Welcome to the perfect jumping-off point for your adventures in Provence. "This is the Provençal heartland of old villages in summer dress, of huge blue skies, herb aromas and old chaps playing boules late into the evening," said an admiring travel writer of Lorgues. Colorful houses line its narrow, winding streets, where you'll encounter ancient stairways, stone carvings and 12th-century towers, along with centuries-old plane trees. You'll also find lively cafes, bars and shops and a bustling farmer's market. Vineyards and olive groves surround the village. The area affords many opportunities for horse riding, hiking, bicycling, canoeing and sampling local wines. You'll find a few of our favorite day trips in our guest guide. 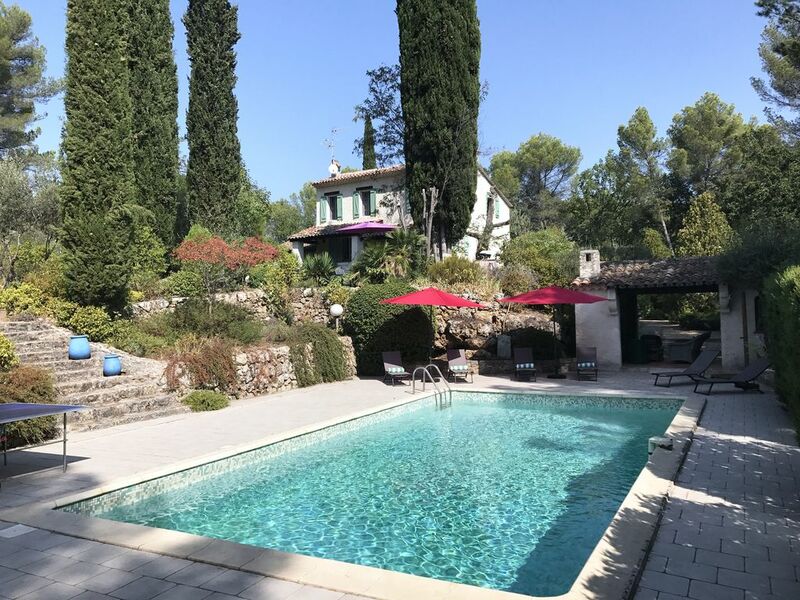 Linda and Gianluca had a dream — to someday own a special property in the South of France, a place that could embody the enchantment and beauty of the Provence region they love. And then to share that home with others. Linda is a talented graphic designer and artist who brings her fine eye to the graceful interiors of Le Mas du Real Laugier. An avid reader and musician (piano and French horn), she has made sure there are plenty of spaces in the home to lounge, to read, to dream. And, as a former student of pâtisserie at l’École Ritz Escoffier in Paris, she maintains her love of French pastry. Gianluca, who works in corporate and entertainment law, is a tech enthusiast. Born in Rome, Italy, he spent his childhood in Italy, France, Quebec and Guadalupe. He's an expert home brewer of craft beers and a history buff. He's always building something (a boat, a bike) or learning something new. He watches over Le Mas du Real Laugier's technology needs, among other tasks. Between them, Linda and Gianluca speak English, French, Spanish and Italian. They love to talk about their Provence home, the quartier (neighborhood) and region. The Mas is located 45 min. from the beaches of Sainte-Maxime and Saint-Raphael, and 1 hour from Saint-Tropez. The mas is located 1 km from the center of Lorgues. We have a lovely pool! There is a fireplace in both the main house and the pool house. We provide bath, and pool towels. We have a cozy outdoor fire pit . Bring your iPod. You can connect by bluetooth to our Big Jambox wireless speaker and have music inside, outside or poolside. Use Spotify for the perfect playlist. With a cozy fire pit! There are two golf courses within 18 km. The pool is is not separately fenced and may not be suitable for young children. Our weekly fee includes an on-call property manager for all your needs; housekeeping; bed, bath and pool linens; and pool and gardens maintenance. The kitchen is well equipped. A deposit of 25% on booking is required to secure your dates. The balance is required 8 weeks before your arrival. Should you decide to cancel your reservation four weeks before your arrival or sooner you will forfeit the 25% deposit. Our expectations were raised due to the high number of 5 star reviews. The house certainly had plenty of character with some individual decorative touches. However, on a practical level this house is not particularly suited to a family with young children. The bedrooms are on different floors and in different parts of the house and very sound proof. The romantically named ‘garden floor’ is more like a basement, my youngest refused to go down there! The ensuite shower down on this floor had tiles falling off the wall. The shower room and toilet off the main bedroom could also do with some updating. The kitchen was very well equipped but lacking in work space. The outside areas were lovely and well maintained with lots of seating and a good BBQ. The pool area was particularly nice but the pool not heated at the time we went even though we asked for this to be confirmed before booking. Apparently it is not heated if the outside temperature is over 26 degrees so check if this is important to you. The area felt very peaceful on the whole but there is a campsite/caravan site (I think that’s what it was!) out the back of the property and music was played very loudly on several occasions. Lorgues and the surrounding area is beautiful, we will definitely return to the area. Thank you for acknowledging that our home has "plenty of character," "the outside areas were lovely and is well maintained . . . and that the pool area is particularly nice." 1) Suitability for children: We have hosted many families with children of all ages who've had a fabulous time. And children who enjoyed exploring the cozy garden room! If families wish to keep kids close by, the top floor offers two bedrooms. Guests also have the option of privacy with single bedrooms on two other levels. 2) The pool: The pool heater is set to allow a refreshing swim during the hot summer months, but our pool service is always at the ready to turn up the temperature by request — as he did for you. 3) The tiles: We were unhappy that we couldn't schedule workmen to fix the few loose shower tiles before your arrival. The shower is being refurbished to our own high standards now that our guest season has ended. 4) Neighbors: Our lovely neighbors do not have a "camper/caravan site," but they do have a camper and a few vehicles on their property, which is quite a distance from our house, given the large yard (with lots of leafy trees to absorb sound). Excellent facilities, well thought through. The pool house was a real bonus & the pool fantastic. Thank you for being our guests Rachel! We are so happy to hear you enjoyed our lovely pool, and your stay in our home. Whilst slightly secluded, we loved our family stay here. Close to town (with excellent markets on a Tuesday) it was relaxing whilst still having enough to do. Awesome stay! Le Mas du Real Laugier is so beautiful -- it looks just like its photos! --from its shimmering pool and towering trees to its thoughtfully furnished interiors. I loved that the house gave us so many ways to either gather together or to be alone. There are multiple outdoor dining possibilities, for many of us or just a few. Mornings I had my first café au lait at the charming table for two on the front porch. Then I'd retire to the swing chair for some serious contemplation. The property is beautifully maintained -- the owners clearly care about the details. And it's so quiet! You feel away from it all, but you're really only a few minutes from Lorgues. We loved Old Town and the Tuesday Market, then going back the next day to sample all the shops and restaurants. (Be sure to try Chez Flo and Le Chris Sandier.) Lorgues is a perfect jumping off point to explore other villages and local wineries. For us, a highlight was the sculpture park at Commanderie de Peyarossol. But, really, you may not want to leave home base. Grab a ping-pong paddle and hang out by the pool. Thank you, Linda and Gianluca, for being such wonderful, responsive hosts. À la prochaine. Until next time!